As iconic news host Larry King prepares to make his exit later this year, much has been and will continue to be written about how King’s time as king of cable news is long gone. People will talk about his softball interviews, laugh at his out-of-touch moments, point to his massive ratings declines. But while this goes on over the next few months, quite possibly here at Mediaite as well, remember what makes Larry King great too. Here’s my favorite Larry King moment ever. King has made for great late night TV comedy fodder – a running gag on Conan O’Brien‘s former Late Night show was simply how old King is. Jimmy Kimmel on ABC has never held back in poking fun at the CNN host either, but the deference is clear as well. 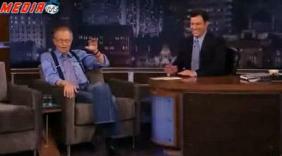 Kimmel has filled in for King as guest host in the past. But it was about one particular event in his life, one event described so expertly down to every last captivating detail it might even make the ‘does King still have it?’ skeptics think twice.